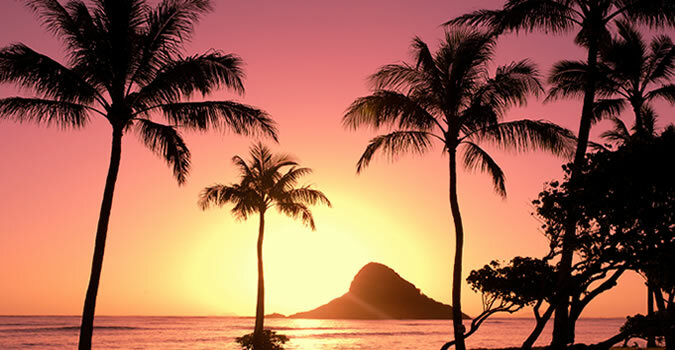 Hawaii offers travelers all the benefits of tropical, lush greenery; land and sea adventures; good food; and exciting culture, rich with color, history and, of course, a little romance. With Hawaii’s multiple ports of call, Hawaiian cruises offer an economical and exciting way to explore America’s 50th state. Most Hawaiian cruises hit the major ports — Honolulu on the island of Oahu, Hilo or Kailua-Kona on the Big Island, Lahaina or Kahului on Maui, or Nawilliwilli on Kuai. Each island has its own characteristics, with adventure to be had and discoveries to be made. Cruises to Hawaii can open up new tropical windows: Go big and swim with the mantra rays at night or dive deep and learn how to scuba dive. Slow down and spend your day on the beach with sweet cocktails and island treats. Learn a sport and take surf lessons or rent snorkeling gear and discover a new marine animal. Eat too much and taste all the wonders of Hawaii's unique cuisine. The possibilities are endless. Hawaii cruises are an exciting way to get swept off your feet with Hawaii’s painted sunsets, crystal-like waters, stunning shorelines, active volcanoes, heritage and picturesque moments that you don’t want to miss. HawaiiCruises.travel offers specialized, discounted Hawaii cruise vacations at highly competitive rates. We’ve been in business since 1995 and in addition to our competitive rates, we offer fantastic customer service. Our representatives are Hawaii savvy, and they’re here to help you book you next cruise to Hawaii. We feature Hawaiian cruise packages on several of the major cruise lines, including Norwegian Cruise Line (NCL), Royal Caribbean, Celebrity Cruises and Carnival Cruise Line. Let us take care of business for you. Get started by surfing our website at HawaiiCruises.travel to book your Hawaiian cruise or call us at 1-877-721-8085 for discounted rates plus free onboard credits. It's Hawaii--let your imagination run wild. SPECIAL LIMITED OFFER: FREE Onboard Credits up to $500 on all Hawaii Cruise vacations. Offer also includes Travel Insurance. Details provided when searching for a specific cruise.